This fruit basket provides the perfect blend of celebration and festivities. Creamy pears, invigorating apples and sweet, ripe pineapple gathered together in this picnic wicker basket. It’s sure to entice the senses. Send this fruit basket celebration to someone that has a fruity appetite and great taste. This fruit and flora basket provides the perfect blend of celebration and festivities. The gorgeous floral bouquet along with Creamy pears, invigorating apples and sweet, ripe pineapple gathered together in this picnic wicker basket. It’s sure to entice the senses. 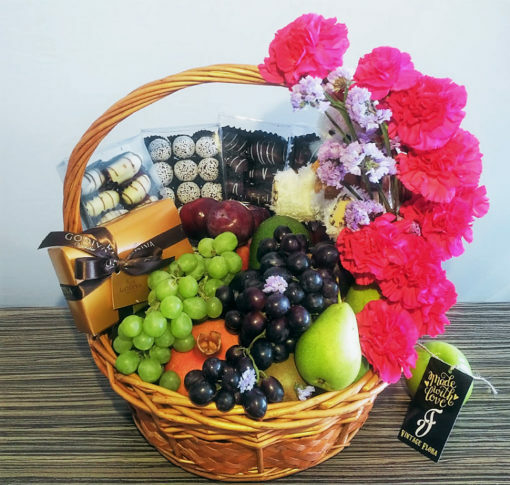 Send this fruit basket celebration to someone that has a fruity appetite and great taste.